FARMINGTON — In coordination with National Nurses’ Week, Franklin Memorial Hospital recognized Sharon Fournier, RN, and Judy Ridley, CNA, as winners of the organization’s seventh annual Excellence in Nursing Award. The award was established to recognize contributions by FMH nurses who support the advancement of nursing. Fournier and Ridley were two of nine nominees, who included Pam Carlton, MA, Internal Medicine; Janine Spiller, CNA, Med/Surg; Tania Dawson, RN, Education; Faith Collins, RN, Emergency Department; Chanda Moody, RN, ICU and ED; Keelin Trask, RN, Maternal and Child Health Unit; and Janine White, RN, Med/Surg. Dr. Jay Naliboff, who recently retired, was declared honorary nurse for the immeasurable support he gave unselfishly to nursing staff. National Nurses Week was May 6-12. 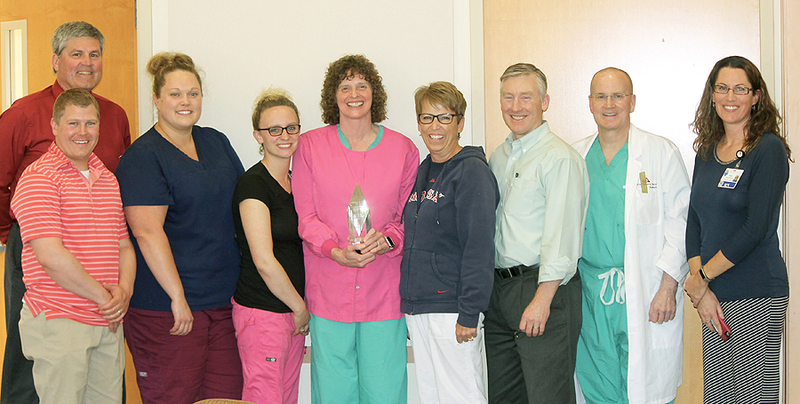 Franklin Health Orthopaedics staff in Farmington recognize Sharon Fournier for her Excellence in Nursing Award. From left, front, are Dr. Zachary Blakeman, Heather Smith, Tia Robbins, Fournier, Carolyn Hastings, Dr. Thomas Pulling, Dr. Joseph Noonan and Molly Chaplin; in back, Fournier’s husband, Don.